Notes: This word does not mean the “news” that you see on TV. Rather, it is the word to describe a piece of information, that we often call “news” in English. 좋은 소식을 들었어요? = Did you hear the good news? 엄마도 올 거야? = Will mom come too? 우리 아빠가 최고예요 = Our/my dad is the best! 아빠가 낚시하러 갔어요? = Did dad go fishing? Notes: Usually, by adding 식 to the end of a noun in Korean, the noun turns into some sort of a ceremony. 결혼 + 식 = marriage ceremony (wedding). 결혼식은 언제예요? = When is the wedding? 만화책을 좋아합니까? = Do you like comic books? 만화책을 왜 좋아합니까? = Why do you like comic books? 아빠가 코딱지만큼 먹었어요 = Dad only ate a little bit! 코딱지를 먹지 마세요! = Don’t eat your boogers! 낮잠을 언제 잤어요? = When did you take a nap? 나는 사자를 보는 게 무서웠지만 어쨌든 우리는 사자가 있는 곳에 도착했다. 하지만 사자는 낮잠을 자고 있었다. = I was afraid of seeing the lions, but, at any rate, we arrived at the place where the lions were. However, the lions were taking a nap. 졸업을 언제 했어요? = When did you graduate? Notes: This often translates to “enter a hospital,” but it actually used to say that one enters a hospital, and then gets admitted. You would not use this word if you enter a hospital to visit somebody or to do some other task there. 어제 병원에 입원했나요? = Did you go to/get admitted to the hospital yesterday? Notes: The opposite of 입원하다, this is not used to indicate that you leave a hospital. It is used when somebody has completed their treatment and is okay to leave the hospital. 언제 퇴원할 수 있어요? = When will you be able to leave the hospital? Notes: In English the words “beat” and “win” are slightly different. However, in Korean, 이기다 is used for both of these words. 고등학교 때는 같이 있는 것이 재미있었고 학교 가는 게 즐거웠었는데! 여전히 친구를 만나니 즐겁고 행복하다. 같은 추억을 가지고 있는 친구와 여전히 친구라는 사실이 이렇게 좋은 줄은 몰랐다. = It was very fun being together during high school time, and I enjoyed going to school (High school was very fun). I am happy and enjoying myself because I am still meeting my friends. I didn’t know it was so good/nice to still have friends with whom I have the same (childhood) memories with (I am glad that I can still meet old friends with whom I share childhood memories with). 너는 내일 한국어를 공부할 거야? = Will you study Korean tomorrow? 누가 내일 한국어를 공부할 거야? = Who will study Korean tomorrow? 한국어를 왜 공부하고 있어요? = Why are you studying Korean? 어제 학교에 왜 안 갔어요? = Why didn’t you go to school yesterday? 집에 언제 갔어? = When did you go home? 집에 언제 갈 거야? = When will you go home? 그 여자가 언제 사라졌어요? = When did that girl disappear? 아빠가 언제 왔나요? = When did dad come? 언제부터 아팠어요? = Since when have you been sick? 한국에서 언제까지 있을 거예요? = Until when will you be in Korea? 언제부터 한국어를 공부했어요? = Since when have you been studying Korean? 결혼식은 언제야? = When is the wedding? 방학은 언제야? = When is vacation? 어디 살아요? = Where do you live? 그것을 어디서 하고 싶어요? = Where do you want to do that? 어디까지 가고 싶어요? = How far/until where do you want to go? 지하철을 어디까지 탈 거예요? = Until where will we ride the subway? 어디야? = Where are you? 친구가 어디에 있어요? = Where is your friend? 엄마가 어디에 있어요? = Where is mom? 펜이 어디에 있어요? = Where is the pen? Notes: Similar to the particle ~도. However, 역시 does not get added directly to nouns. 벌써 나갈 거야? = You are already leaving? 학교가 벌써 끝났어요? = School is already finished? 하지만 시간이 흐르면서 나는 점점 더 외로움을 느꼈다. 특히 친하게 지냈던 친구들이 각 자 자기 나라로 돌아가기 시작하자 더 외로움을 느꼈다. = But, as time when by, I gradually started to feel lonely. Especially as/when each of my close friends started to go back to their own countries, I felt lonelier. 특히 내가 가장 좋아한 선물은 바로 분홍색 인형이었다. 그 인형은 너무 귀엽고 색깔도 예뻤다. 우리는 생일 축하 노래를 부르고, 선물을 교환하고 맛있는 음식을 먹었다. = My particularly favorite present of all was the pink doll. That doll was very cute and the color was pretty. We sang ‘happy birthday,’ exchanged presents and then ate delicious food. 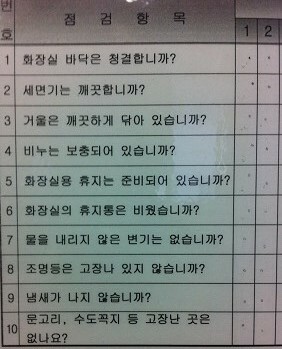 Asking questions in Korean, at first glance, is very easy. For the most part, asking questions in Korean without the use of a “question” word (who/what/when/where/why/how/how much/how many) is incredibly simple. Asking questions in English is unnecessarily complicated. If I asked you the question “Do you like sports?” In English, what is the meaning of the word “do” in that sentence? In English, whenever we ask a question (without a question word), we need to include the words did/do/will to make the listener know that we are asking a question. It is so confusing in English, and my two sentence explanation doesn’t really explain it very well. Luckily, this is not an English learning website! You are here to learn how to ask questions in Korean. Enough of this English nonsense. Remember that Korean people rarely say the word “you,” so if you ask a question to the person you are talking to about the person you are talking to, you can just omit the subject of the sentence. 밥을 먹었어? = Did (you) eat? 집에 갔어? = Did (you) go home? 소식을 들었어? = Did (you) hear the news? 남동생은 울었어요? = Did your brother cry? 한국은 좋은 나라야? = Is Korea a good country? As I said, you don’t need to change anything structurally in these sentences to make them questions. There are, however, a few ways that you can change the structure of a sentence to make the sentence a question (if you want). 내일 학교에 갈 겁니까? = Are you going to school tomorrow? 내일 학교에 갈 것입니까? = Are you going to school tomorrow? I work at a school in Seoul. In the bathrooms, there are charts on the walls that the cleaning staff is supposed to check once per day. Written on these charts is a list of questions about the state of the bathroom. While you will not understand most of the words on this list, notice that all of the sentences (except for the last one) has the ending ~ㅂ/습니까? Is the bathroom floor clean? Has the mirror been wiped clean? Is the toilet paper ready? Is the bathroom’s garbage can empty? Are there no toilets that haven’t been flushed? Are there any places, the doorknob, the faucet, etc that are broken? There are other ways you can change a sentence to make it a question. ~ㅂ/습니까 is typically the most formal. We will talk about the others in the upcoming sections. However, note that using this form gives the sentence a slightly feminine feel to it (I’ve never once used ~니). However, I work at a Korean high school, and I hear female Korean teachers use this form all the time when asking questions to a student. 시험을 잘 봤니? = Did you write the exam well (did you do well on the exam)? 서울에 가겠니? = Are you going to go to Seoul? 몇 반이니? = What class are you in? 이미 졸업했니? = Did you already graduate? In Lesson 7, you learned how irregular words change as a result of adding different additions. This is the first time you have been introduced to adding ~니. As you know, some additions require the speaker to choose between two possible options – for example, choosing between ~아 and ~어 when adding ~아/어. Notice that when adding ~니 there is no choice. I call this a “solid ㄴ.” That is, there is only one choice, and it starts with ㄴ. 뭐 만드니? = What are you making? 마음에 드니? = Do you like it? 어디 사니? = Where do you live? Just like ‘~니’ you can also end your questions with ~ㄴ/은가(요). Adding “요” to the end makes it more formal. This form is less formal than the high-respect ~ㅂ/습니까 form. 그 여자는 예쁜가? = Is that girl pretty? 이것은 너무 작은가요? = Is this too small? 그 학교가 좋은가? = Is that school good? 일이 너무 복잡한가요? = Is this work/task too complicated? 그 사람이 선생님인가? = Is that person a teacher? 그 여자는 한국에서 가장 예쁜 여자야. 아닌가? = That girl is the most beautiful girl in Korea… no?/isn’t she? 너무 복잡해! 아닌가? = This is too complicated. Isn’t it? 밥이 있나? = Is there rice? 사과도 여기서 파나요? = Do you sell apples here too? 소녀시대 콘서트를 여기서 하나요? = Is the Girl’s Generation concert here? 지하철을 타고 있나요? = Are you on (riding) the subway now? 교통카드가 있었나요? = Did you have your bus (transportation) card? 그 소식을 들었나요? = Did you hear that/the news? 어제 병원에 입원했나요? = Did you go to the hospital yesterday? Depending on which question word you are using, building a question can be really easy or really confusing. I will teach you the easy examples in this lesson (who, when, where, why) and the more confusing examples in the next lesson (what, how, how much/how many). Why (왜) is probably the easiest question word in Korean. ‘왜’ is an adverb, which means it can be used/placed as an adverb in sentences. Many of the question words that you will learn in this lesson (and the following lesson) are adverbs. As you know, adverbs can be used very freely in sentences and do not have any specific location that they need to be used. However, the most common position for these adverb-question words is before the verb. If there are other adverbs in the sentence (including the negative “안”) the question word is usually placed first. Notice that saying “why” in English is unnatural. This is how they say it in Korean. 집에 갔어? = Did you go home? 집에 갈 거야? = Will you go home? 낮잠을 잤어요? = Did you take a nap? 아빠가 왔어요? = Did dad come? Notice that 어제 and 언제 are not the same word. The grammatical principle ~든지 is commonly attached to 언제 to form 언제든지. For now, you can think of this simply as a word that means “whenever.” When you learn about the function of ~든지 in Lesson 106, you will understand how this meaning is formed. Just like 여기, ~에 is often omitted from “어디.” 어디에서 is often contracted to 어디서. 너의 집이 어디야? = Where is your house? 그곳이 어디야? = Where is that place? 학교가 어디예요? = Where is the/your school? 아빠가 어디에 있어? = Where is dad? 그 만화책이 어디에 있어? = Where is that comic? Just like 언제, there are of course more complicated ways that 어디 can be used. For now, this is good enough. In Korean, 누구 has the function of a pronoun. Actually, some of the ways you use 언제 and 어디 in Korean are pronouns. I chose not to explain this to you because the definition of a pronoun in Korean and English is not exactly the same. 언제 and 어디 can act as pronouns in Korean, but this same usage would be called an adverb in English. I actually had an explanation typed out, but decided not to include it into this lesson because it makes things more confusing than they actually are. However, knowing that 누구 is a pronoun in English and Korean is helpful (if you know what pronouns are). As a pronoun, 누구 can be used in the place of a noun in a sentence – that is, it can be used to replace the object, the subject or as a noun before 이다. However, this is confusing in English because in all three cases “who” is the first word of the sentence regardless of its role. In the third sentence below you can see an example of 누구 being used as a subject. The subject is underlined in each case. When 누구 is used as the subject of a sentence, it is changed to 누가. In the third sentence below you can see an example of 누구 being used as an object. The object is underlined in each case. The object particles can be used if 누구 is the object. 너는 내일 친구를 만날 거야? = Will you meet a friend tomorrow? 너는 내일 누구(를) 만날 거야? = Who will you meet tomorrow? 그 사람은 너의 아버지야? = Is that person your dad? 그 사람은 누구야? = Who is that person? That’s it for this lesson, but there is still lots for you to know about asking questions in Korean! This lesson covered the first half of what you need to know, and the following lesson (Lesson 22) will cover the rest!